If you already have a PayPal account you can simply login to your account on the PayPal page after you checkout. 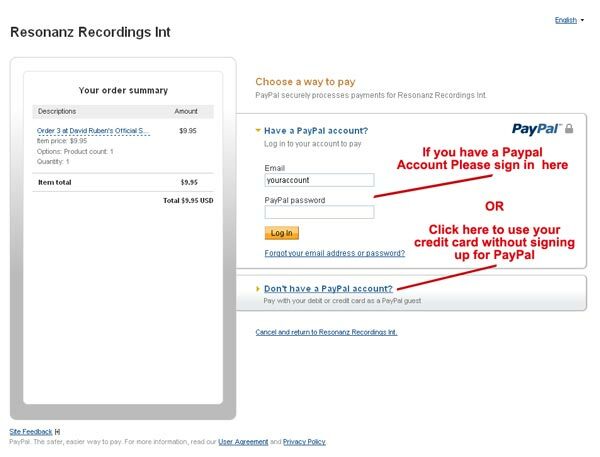 If you don't have a PayPal account, or prefer to pay with your credit card, when you reach the PayPal page - just click "I don't have a PayPal account" to use the credit card from instead. Please note: if you are using a credit card that has already been associated with a PayPal account, PayPal will require you to sign in to that account. If you can't remember your PayPal password just use their password recovery form at www.paypal.com. Your security is of our highest concern, which is why we use PayPal which has numerous security measures in place plus a very thorough 'buyer protection policy'.